Setting alerts to important chat messages is a growing trend on WhatsApp, Hike, Telegram, SnapChat and other popular chat messengers in countries such as South Africa, Brazil, India, Singapore, Netherlands or Dubai that host a large number of user base. When you are a part of a large group or using WhatsApp and Hike for important business & personal communication, you need more than just chatting and saving messages to email or cloud. Setting an alert is one of an important need once should always have. Why set alerts to WhatsApp & Hike chat messages? 1. Doctors: If you are a doctor who consults patients on WhatsApp regularly. You can easily set an appointment reminder on a message from a patient that you need to meet. 2. Real Estate Agency: A real estate agent can easily set an alert to follow up with a client or buying or selling of a property that he has sent an enquiry to you on WhatsApp or Hike. 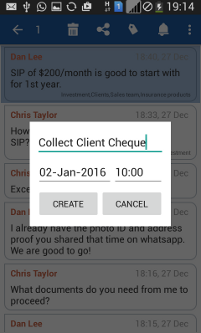 Simply set a reminder to that message of the client. 3. Insurance Agents: Insurance agents can set reminders to follow up for policy premiums, claims settlement, new policy update and communicating with their clients. This definitely is useful when they are communicating with a large number of people on WhatsApp receiving thousands of messages, enquiries or updates. 4. Manufacturers/Suppliers: You can easily benefit from setting reminders for delivery schedules, payment schedules and follow-ups with your customers. 5. Hotels & Restaurants: Setting up reminders is very important in this case when you are accepting food orders through WhatsApp or Hike. A customer may place an order in the morning for delivery of food in the evening. In that case, you must have a reminder set to that order to not to forget or delay. Setting reminders to WhatsApp or Hike chat messages is not only important for above professionals but anyone who uses WhatsApp, Hike or any other chat messenger for business and personal communication. There are many more advantages of Bag A Chat app than just the above. See here bagachat.com.